Buy before 2 p.m. Central Daylight Time (tomorrow) November 4. 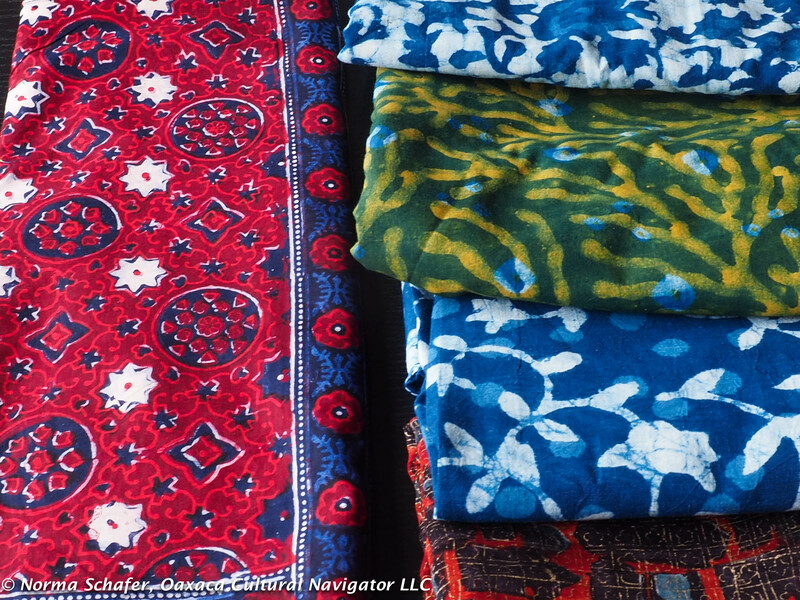 I will bring your purchase(s) to the U.S.A. when I travel on Thursday morning and ship from California to anywhere in the U.S.A. early next week. Shipping included in price. I’m making this unexpected trip to help care for our mom. Must be prepaid with PayPal for me to pack and bring. I will send you an invoice. Tell me which one you want. These are the ones you see in the Guelaguetza! 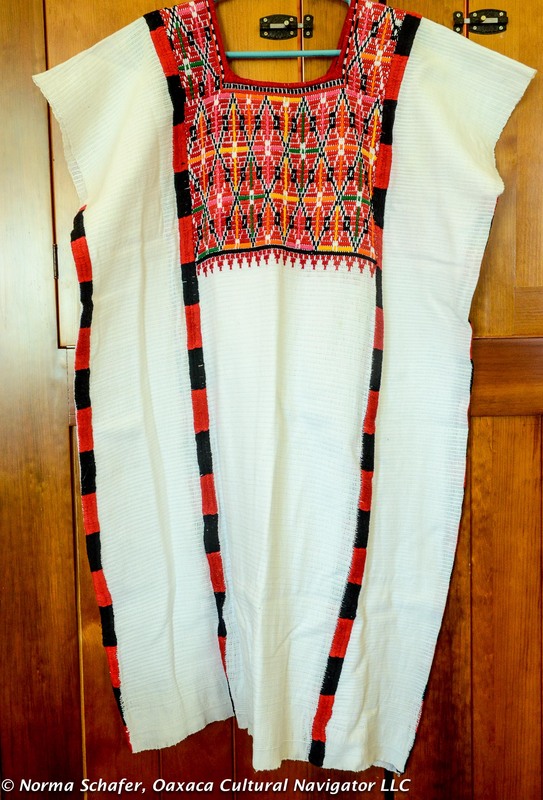 All huipiles/dresses measure about 42″ long from shoulder to hem, and about 28″ wide. 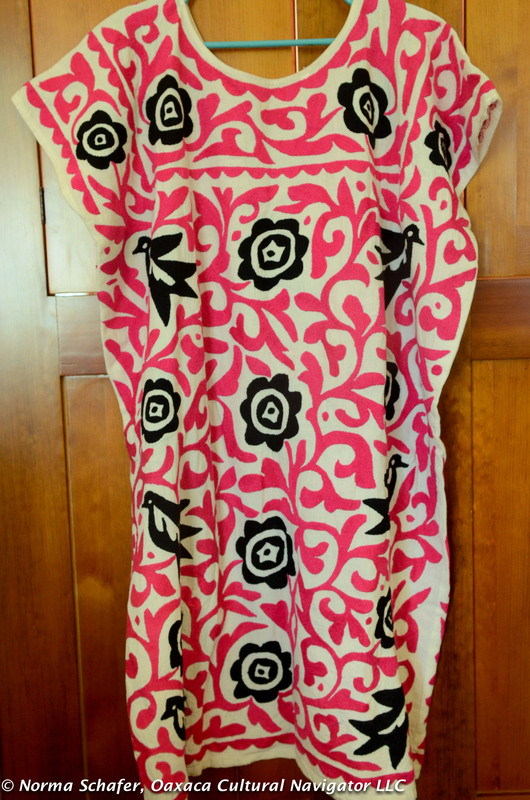 They can fit size L-XXL body and drape very nicely. 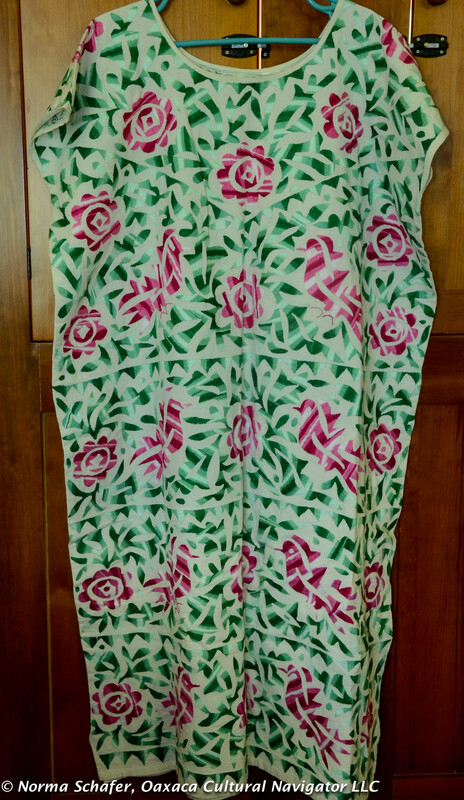 From my collection and purchased directly from the women who made them. New. 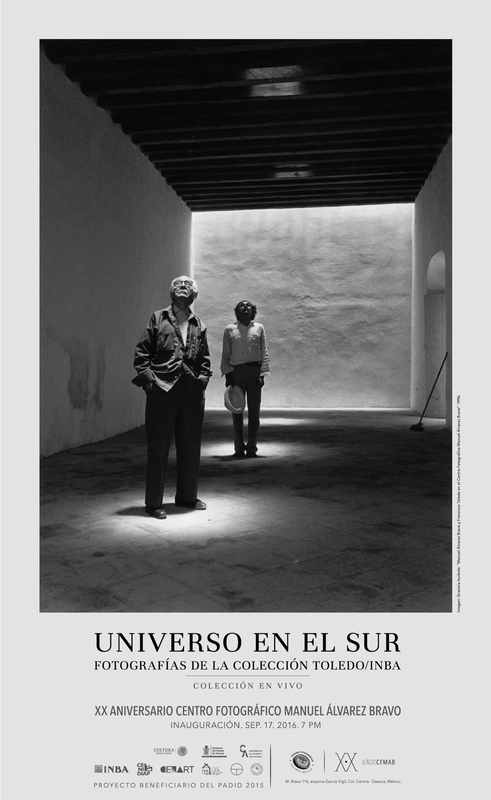 SFU1: Above. 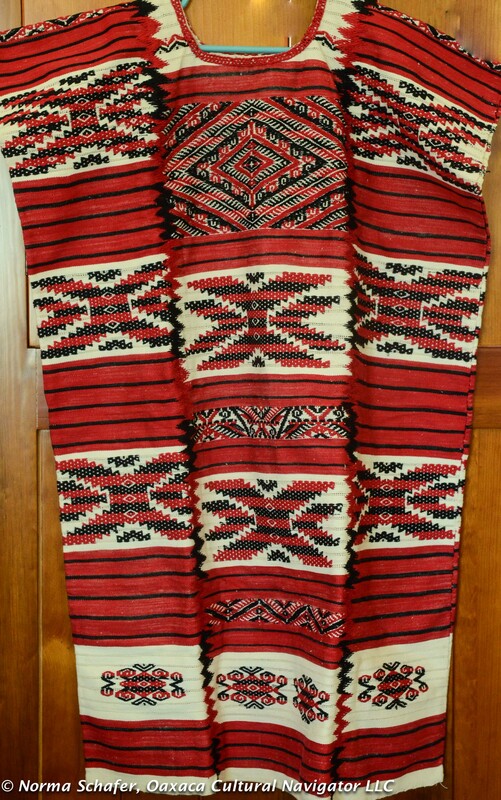 hand-woven on back strap loom in traditional red and black San Felipe Usila style with extravagant supplementary weft and hand embroidered. $295. SFU2: Above. 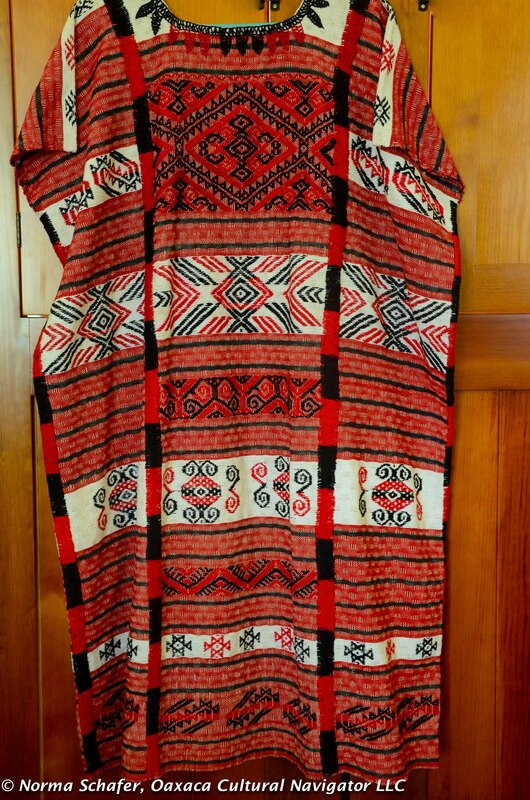 hand-woven on back strap loom in traditional red and black San Felipe Usila style with supplementary weft, a simpler version of SFU1. $250. 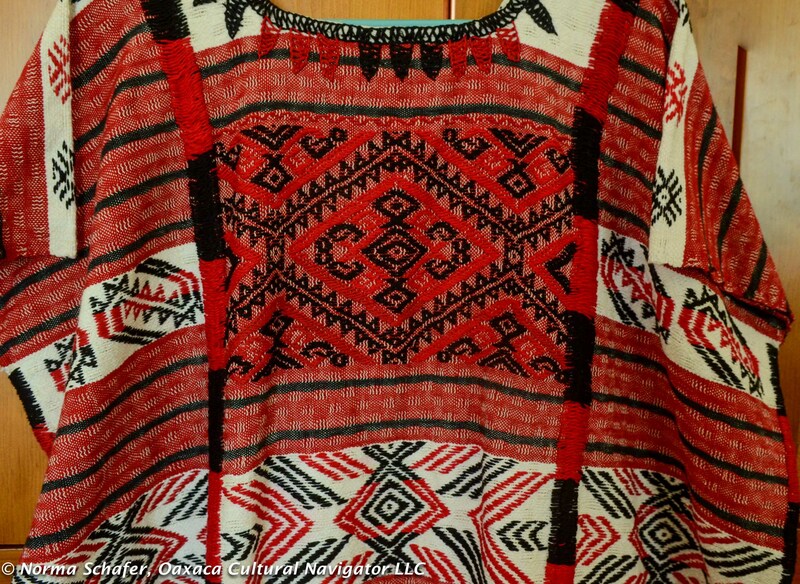 SOY1: Hand embroidered in the village of Soyaltepec, an island in the Miguel Aleman Dam in the remote Chinantla region of Oaxaca about 8 hours from Oaxaca city. 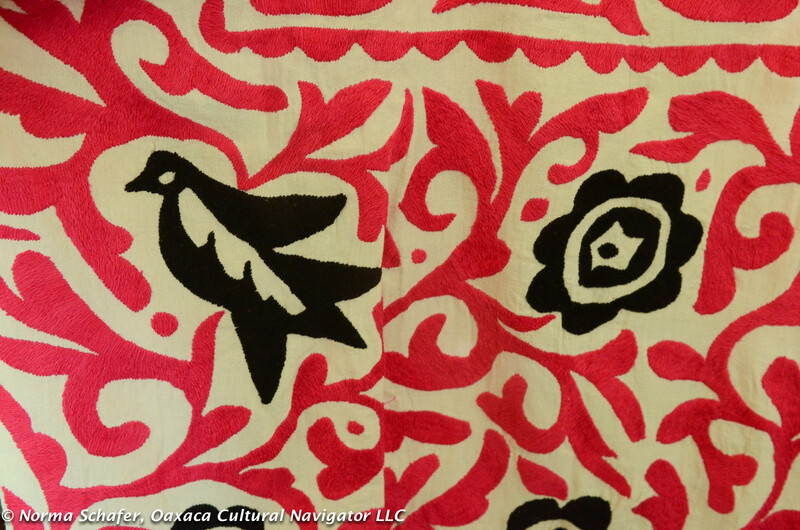 Fuchsia and black flowers and birds on finest quality, soft muslin cotton — what the locals wear. $235. 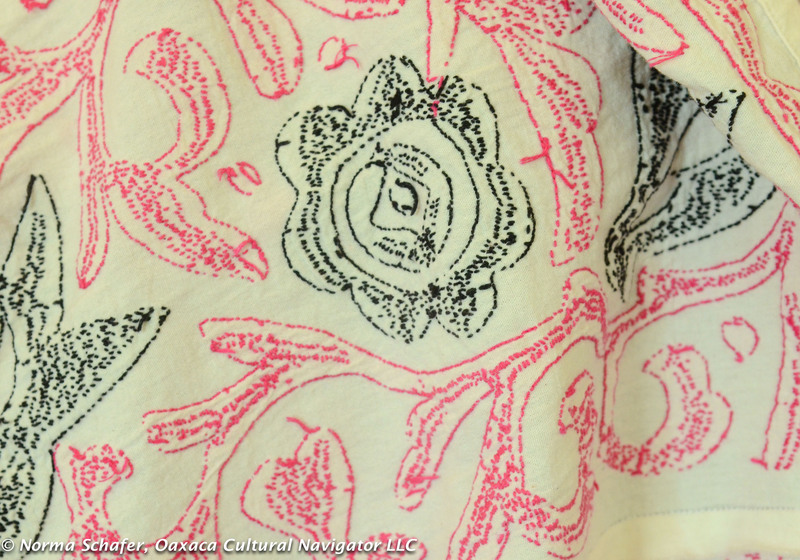 SOY2: Hand embroidered in the village of Soyaltepec. 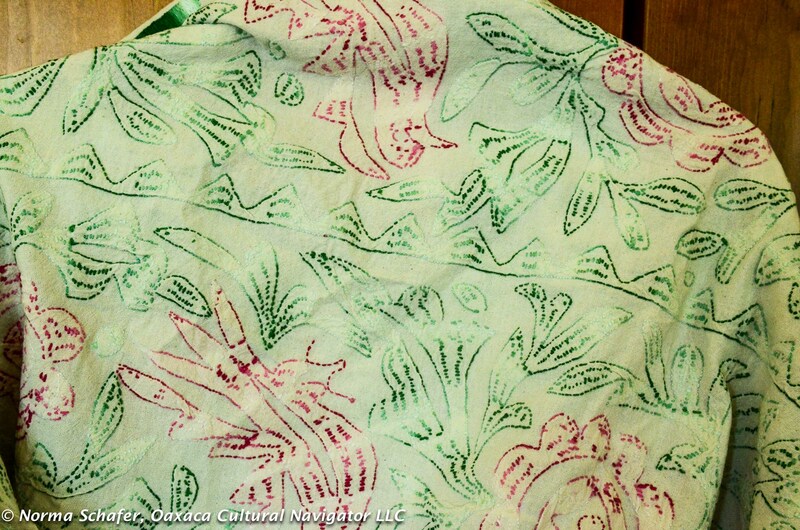 Variations of green and fuchsia on muslin cotton. $275. 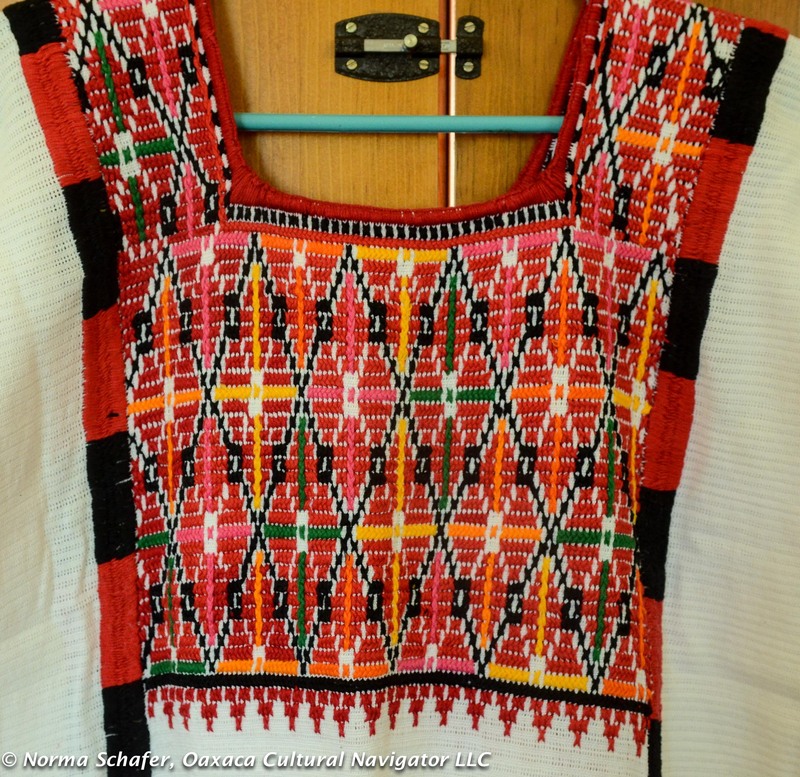 VALLE1: Handwoven cotton on a back strap loom with hand embroidered cross stitch bodice from the town of Valle Nacional in the Tuxtepec region of Oaxaca. A knock-out and very comfortable. $155. 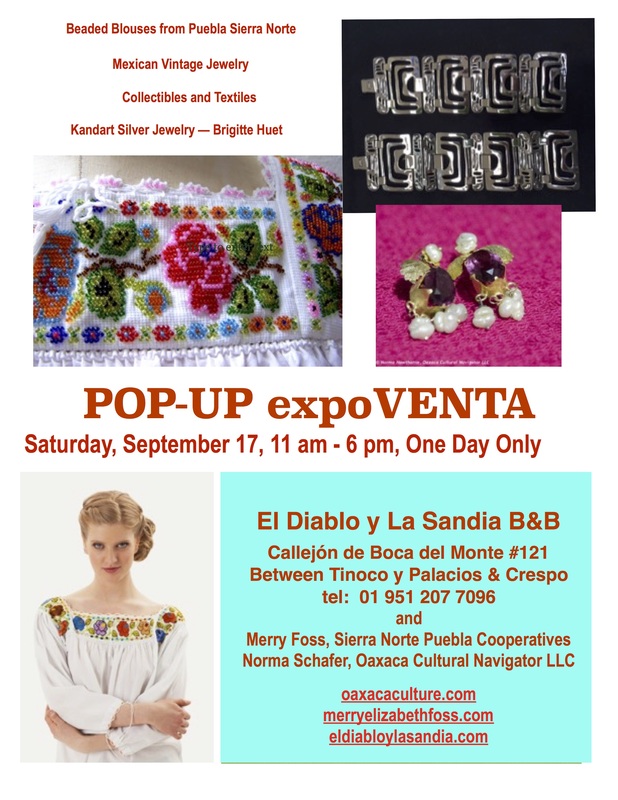 Today, Thursday,October 29 until 5 p.m. at El Diablo y La Sandia Boca del Monte 121. This is a little street located between Tinaco y Palacios and Crespo, between Allende and Quetzalcoatl. Come up the hill from Santo Domingo to Tinaco y Palacios. Turn right. Turn left onto Boca del Monte and we are there on the right! Gorgeous dresses and blouses. Reasonable prices. $$ direct to weavers. Please spread the word. 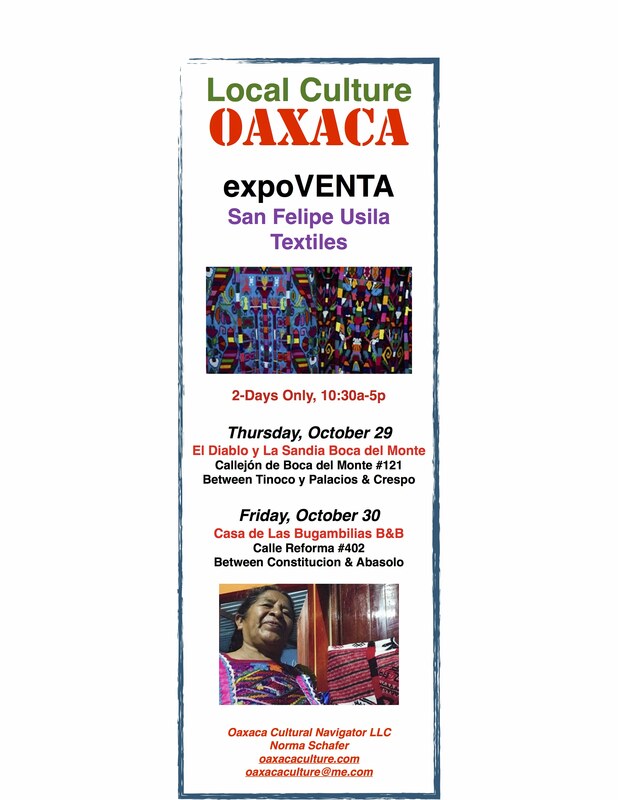 San Felipe Usila is a remote mountain village near Tuxtepec, about an eight-hour drive from Oaxaca. 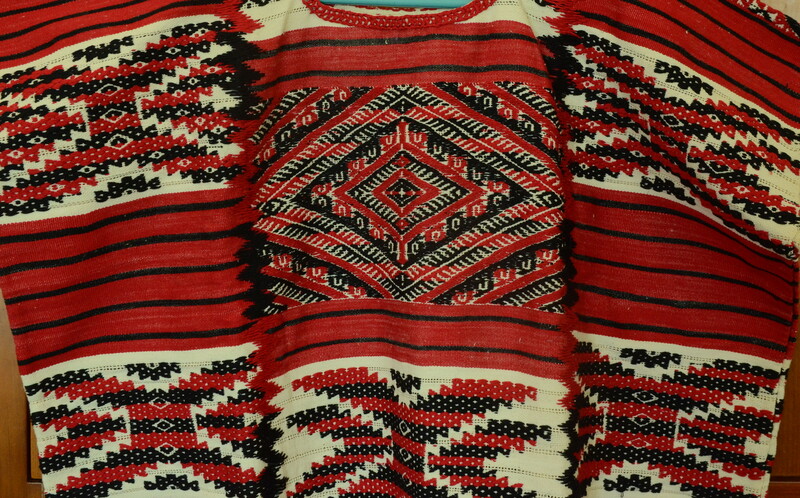 The women weave extraordinary textiles on back strap looms. I was there last October and met a talented family. 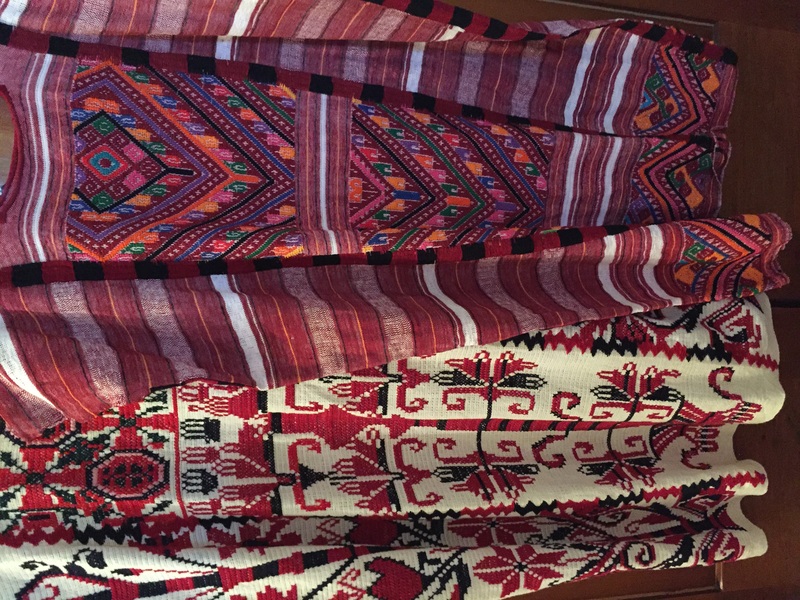 Jorge Isidro is coming with his mother, an accomplished weaver, and bringing excellent quality pieces to show our Women’s Creative Writing and Yoga Retreat participants. Because he is making such a long trip, I want to open up the opportunity to you to see and buy the work. 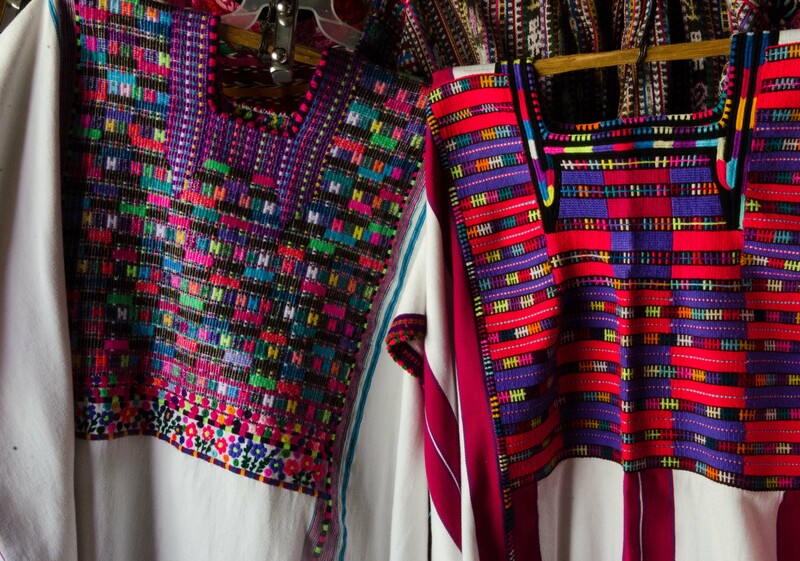 The sales go directly to the weaving families. Prices are reasonable because you are buying direct. 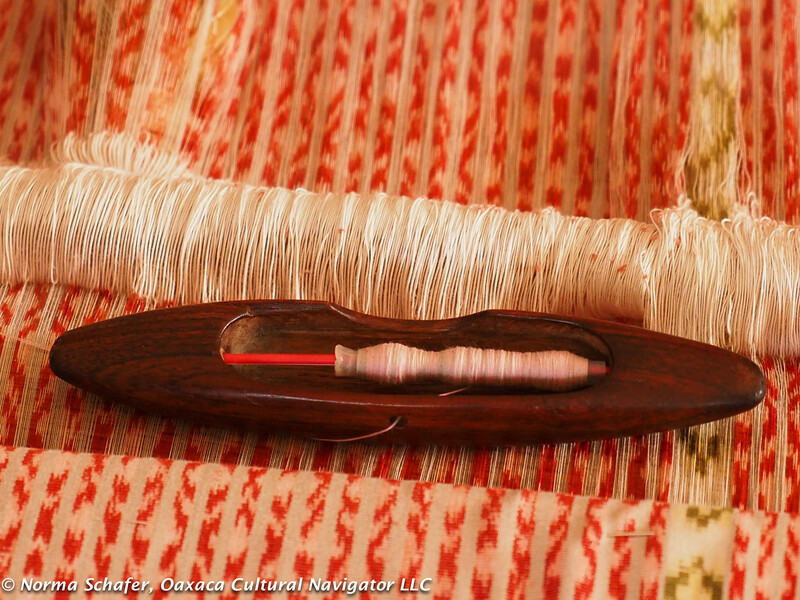 Please invite your friends and share this post to support fine indigenous Oaxaca textile culture. Thank you.